Street Fighter, Resident Evil, Monster Hunter, and more. Capcom has announced its stage schedule for Tokyo Game Show 2016. It has also added the recently announced Megami Meguri to its previously confirmed Tokyo Game Show 2016 lineup. It will be playable, have a stage event, and be live streamed. Find Capcom’s full stage schedule below. 10:25 to 11:05 – Street Fighter V Special Stage – Featuring Tomoaki Ayano (assistant producer) and guest Kazunoko (pro-gamer). Come see the true ability of the Capcom Tour 2015 champion! There may be some new information, too! 11:20 to 12:10 – Monster Hunter Stories Pre-Release Special Stage – Featuring Ryozo Tsujimoto (producer), Kenji Oguro (director), Kaname Fujioka (setting director), and guest MAO (Nabiru voice actress). The latest gameplay, plus a talk corner and competition gameplay with Nabiru voice actor MAO. The latest information will also be shared. 12:25 to 13:10 – Resident Evil Special Stage Part 1: Resident Evil 7: biohazard Stage – Featuring Masachika Kawata (producer) and Tsuyoshi Kanada (producer). The latest information on the numbered Resident Evil game. 13:20 to 13:50 – Resident Evil Special Stage Part 2: Resident Evil 20th Anniversary and Movie Contents Stage – Featuring Hiroyuki Kobayashi (producer) and Masachika Kawata (producer). A producer talk stage full of Resident Evil-related information. The laetst information on the live-action Resident Evil: The Final Chapter and the CG Resident Evil: Vendetta, too! 14:05 to 14:50 – Megami Meguri Debut Stage – Featuring Ayasa Ito (Tsukumo voice actress) and Yuka Ozaki (Amaterasu voice actress). An introduction to and the latest information on Megami Meguri. The guest voice actresses will share stories from their recording sessions and talk about various things. 15:00 to 15:40 – Phoenix Wright: Ace Attorney Series 15th Annivesrary Talk and Latest Information Special Stage – Featuring Eshiro Motohide (producer) and guests Takayuki Kondo (Phoenix Wright voice actor) and Kenn (Apollo Justice voice actor). A talk and latest information stage to celebrate the Ace Attorney series’ 15th anniversary. The information segment will be packed with welcome news! 16:00 to 16:40 – Sengoku Basara: Sanada Yukimura-Den Special Stage – Featuring Hiroyuki Kobayashi (series producer). The producer of the Sengoku Basara series introduces the charm of Sengoku Basara: Sanada Yukimura-Den, the most recently launched entry. Attendees will also be able to receive Sengoku Basara goods. 10:30 to 11:10 – Monster Hunter Explore Latest Update Unveil Special – Featuring Chiaki Yamamoto (management producer) and Yuuki Okano (director). The latest information on Monster Hunter Explore update version 5.0, which brings new monsters, weapons, and armor. 11:50 to 12:35 – Toraware no Palm Stage – Details for this stage coming in a few days. 13:00 to 13:40 – Dragon’s Dogma Online Special Stage – Featuring Kento Kinoshita (director) and Yuichi Takeuchi (management director). A stage featuring information on the “Season 2.1 Update” of Dragon’s Dogma Online, which has seen over two million downloads and over 100,000 players logged in at once. Additionally, real-time matching with users in an online battle. 13:40 to 14:05 – Captured in Toraware no Palm – Featuring actress Chocolat Ikeda. 14:10 to 15:00 – Monster Hunter Stories Pre-Release Special Stage – Featuring Ryozo Tsujimoto (producer), Kenji Oguro (director), Kaname Fujioka (setting director), and guest Ryota Osaka (Cheval voice actor). The latest gameplay, plus a talk corner and competition gameplay with Nabiru voice actor Ryota Osaka. The latest information will also be shared. 15:40 to 16:00 – Going Around in Megami Meguri – An introduction to and live gameplay of Capcom’s newly announced communication game Megami Meguri. 16:10 to 16:50 – Teach Me Monster Hunter Stories! Tsujimoto-Sensei’s TGS Special – Featuring Ryozo Tsujimoto (producer), Kaname Fujioka (setting director), and Kenji Oguro (director). The development team plays Monster Hunter Stories. What new information will they share? 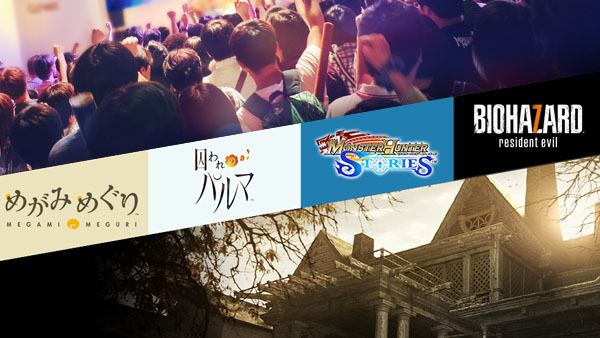 15:15 to 16:00 – Resident Evil Special Stage Part 1: Resident Evil 7: biohazard Stage – Featuring Masachika Kawata (producer) and Tsuyoshi Kanada (producer). The latest information on the numbered Resident Evil game. 16:10 to 16:40 – Resident Evil Special Stage Part 2: Resident Evil 20th Anniversary and Movie Contents Stage – Featuring Hiroyuki Kobayashi (producer) and Masachika Kawata (producer). A producer talk stage full of Resident Evil-related information. The laetst information on the live-action Resident Evil: The Final Chapter and the CG Resident Evil: Vendetta, too! If you missed it, catch Capcom’s lineup of games for Tokyo Game Show 2016 here. Tokyo Game Show 2016 runs from September 15 to 18.